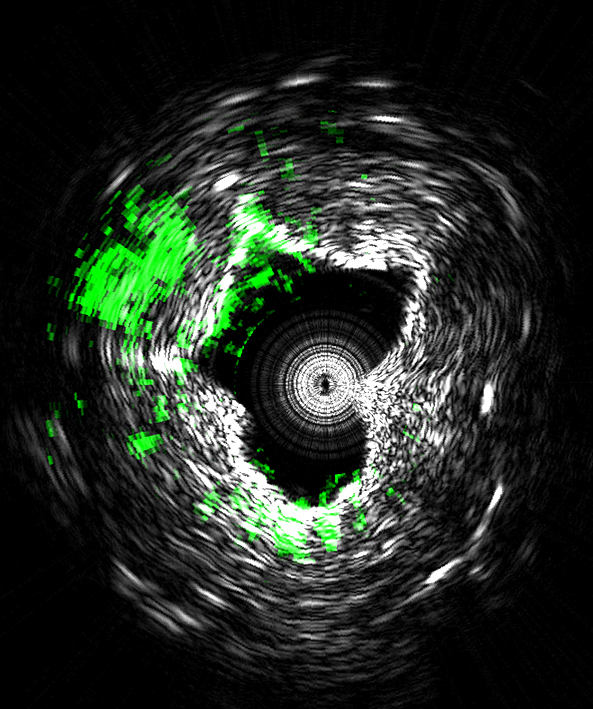 The system takes precise three-dimensional images of plaques lining arteries and identifies deposits that are likely to rupture and cause heart attacks, said Ji-Xin Cheng (pronounced Jee-Shin), a professor in Purdue University’s Weldon School of Biomedical Engineering and Department of Chemistry. The imaging reveals the presence of carbon-hydrogen bonds making up lipid molecules in arterial plaques that cause heart disease. Research findings are detailed in a paper appearing online Tuesday (Nov. 4) in the Nature journal Scientific Reports. Research in the area has been hindered by the inability to perform high-speed imaging in tissue. The researchers solved the problem by developing a Raman laser using a laser that produces 2,000 pulses per second, each pulse capable of generating an image, representing a 100-fold increase in the imaging speed of the new technology, called intravascular photoacoustic imaging. “This innovation represents a big step toward advancing this technology to the clinical setting,” Cheng said. The paper was authored by researchers from Purdue, Indiana University School of Medicine, the University of California, Davis, the University of California, Irvine, and startup company Spectral Energy. The imaging technique is “label free,” meaning it does not require samples to be marked with dyes, making it appealing for diagnostic applications. The technology is being commercialized by the company Vibronix Inc., co-founded by Cheng and Purdue postdoctoral research associate Pu Wang. The laser, which pulses in the near-infrared range of the spectrum, causes tissue to heat and expand locally, generating pressure waves at the ultrasound frequency that can be picked up with a device called a transducer. The paper was authored by Wang; USC graduate student Teng Ma; Purdue research scientist Mikhail N. Slipchenko; USC graduate student Shanshan Liang; Purdue graduate student Jie Hui; K. Kirk Shung, director of the Ultrasonic Transducer Resource Center at USC; Sukesh Roy, CEO of Spectral Energy LLC in Dayton, Ohio; Sturek; USC researcher Qifa Zhou; Zhongping Chen, a researcher at UC Irvine; and Cheng. The system is small enough to be incorporated into an endoscope to put into blood vessels using a catheter, said Cheng. The near-infrared laser causes enough heating to generate ultrasound but not enough to damage the tissues. The research was conducted with intact pig tissue and will expand to research with live animals and then clinical studies with humans. The Purdue Office of Technology Commercialization has filed a U.S. patent application. Funding sources for the research include the National Institutes of Health and the American Heart Association. Note to Journalists: An electronic copy of the paper is available from Emil Venere, Purdue News Service, at 765-494-4709, venere@purdue.edu. 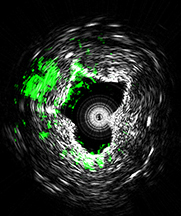 Lipid deposition inside the arterial wall is a key indicator of plaque vulnerability. An intravascular photoacoustic (IVPA) catheter is considered a promising device for quantifying the amount of lipid inside the arterial wall. Thus far, IVPA systems suffered from slow imaging speed (~50 s per frame) due to the lack of a suitable laser source for high-speed excitation of molecular overtone vibrations. Here, we report an improvement in IVPA imaging speed by two orders of magnitude, to 1.0 s per frame, enabled by a custom-built, 2-kHz master oscillator power amplifier (MOPA)-pumped, barium nitrite [Ba(NO3)2] Raman laser. This advancement narrows the gap in translating the IVPA technology to the clinical setting.